Where do I come from? The DNA analysis aspect of genealogy keeps trying to answer this question. By comparing an individual’s DNA with the same from a number of control groups, science is trying really hard to come up with an answer. The more I look into these DNA analyses, the less I think they hold any relevance to identity. And the explanation for this lack of relevance is completely clear, and if more people understood this, they’d probably stop using DNA as a gateway to how they are composed as an individual. The problem is that every human inherits about half of his or her DNA from each of his or her parents, but it’s impossible to predict which half, or what DNA markers are included in that half. This is how this problem manifests itself over two generations in an incredibly simplified example. Let’s say you know the birth locations of your four grandparents, and they happen to be Germany (father’s father), England (father’s mother), Lithuania (mother’s father), and Romania (mother’s mother). If you were to describe myself with just this information, taking the notion of Jewish heritage out of the mix, you would say you’re quarter German, quarter English, quarter Lithuanian, and quarter Romanian. This assumes that each of these grandparents are completely “full booded” in their geographic make-up — and that’s not just unlikely, but impossible, and is yet another fault with searching for some kind of genetic explanation of geographic heritage. Even if the grandparents represented some kind of perfection, your genetic makeup would more than likely not contain four equal components. Your father inherited roughly half his DNA from each of his parents, so he is roughly half German and half English. Your mother did the same, so she is roughly half Lithuanian and Romanian. That’s only because in this strange hypothetical example, the grandparents are each homogeneous. The succeeding generation, everything falls apart. You inherit half your DNA from your father, who is half German and half English. But the half you inherit is not necessarily split evenly between your father’s German half and his English half. The DNA you inherit — your admixture — could be only his English DNA, it could be only his German DNA, it could be precisely 50% each side, but it most likely is some kind of unbalanced mix. So half of your DNA is most likely an unbalanced mix of German and English, and the other half is most likely an unbalanced mix of Lithuanian and Romanian. Your sibling could have inherited a different mix from each of your parents, and could thus have a significantly different geographical genetic fingerprint than you. But why should your sibling be different? He or she had the precisely the same family history through the centuries and the same migration patterns. By the time you look back to your sixty-four fourth great grandparents, the chances are high that one is not reflected at all in your DNA today. 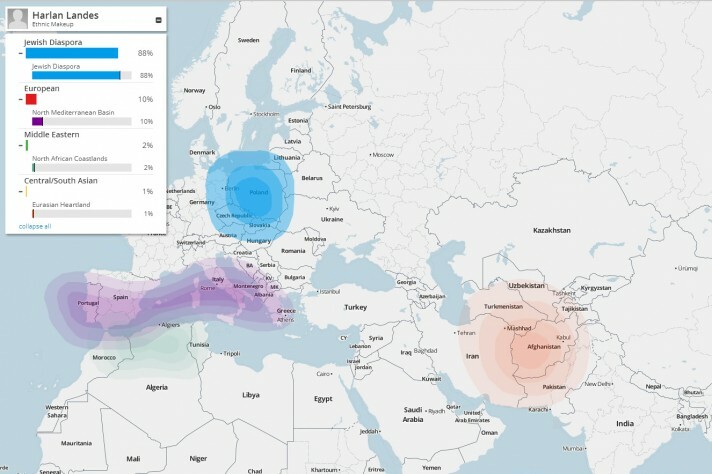 I increasingly believe that while ancestral maps based on autosomal DNA tests are interesting to look at, they can’t really tell you the full story people really want to see. 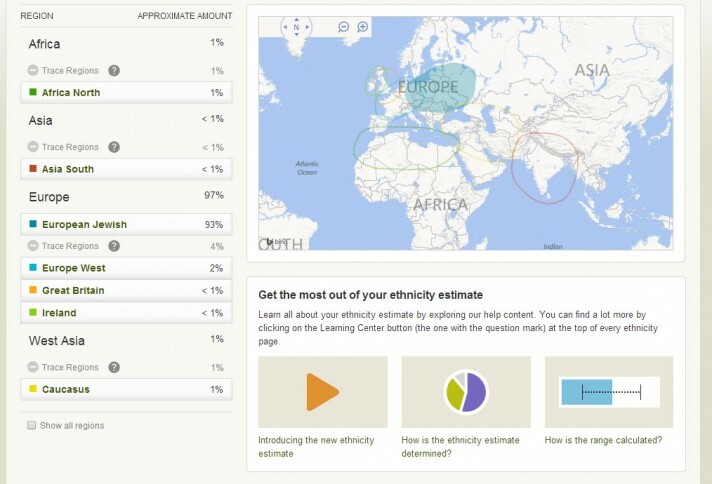 Above is what FamilyTreeDNA’s new My Origins analysis has determined for my geographical make-up based on my autosomal (FamilyFinder) DNA test. It’s not terribly different from the analysis provided by AncestryDNA with that company’s autosomal test. These might reflect an accurate approximation of the geographic locations some of my ancestors lived at some point in their lives, but it doesn’t tell nearly the complete story of my ancestors. Some might be completely missing from the calculation. The geographic regions may only extend to several hundred years ago. The genetic material that represents a focus in Poland may come from a different century than the material that represents Afghanistan. There is no way to turn this information into a description that has a strong relevance to who I am. So if you decide to take a DNA test looking for some sort of insight into your genetic composition, keep these caveats in mind. These results seem to exist only to satisfy curiousity with a scientific “answer,” even if that answer doesn’t exactly answer the question people really have about who they are. Hello – I am on ancestry.com and trying the two week trial. We seem share common relatives per the site – My great grandfather was Abraham Norwalk (his grandson via daughter Selma is my father) Your tree indicates it includes his father Simon Norwalk (aka Izchock Shimen Nowak) As I look at your site I don’t see the relation but I may not know what to be looking for at this point. Let me know if you can enlighten me in any way. Please feel free to respond if you wish directly to me at my email address. Thanks!